Payment for service is due at the time of each visit and may be paid by credit card. We accept MasterCard/Visa and American Express. 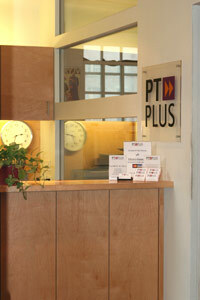 PT Plus does all of your insurance authorization and billing paperwork for you as a courtesy. A typical session at PT Plus usually lasts for one-hour. After your initial evaluation, each follow-up visit will begin with a brief reassessment by your physical therapist followed by hands-on care and supervised exercises. Be sure to bring your valid prescription and insurance card to the first visit. Wear or bring comfortable workout clothing, such as shorts, a tee-shirt and sneakers. We have lockers for your daily use.